Review of Balkanholidays.co.uk. Holidays to Bulgaria, Croatia, Montenegro, Slovenia, Serbia and Romania. Balkan Holidays is an independant specialist tour operator offering low cost holiday deals to Bulgaria, Croatia, Montenegro, Slovenia, Serbia and Romania. The company is is business for 45 years and offer discount summer beach holidays, winter ski holidays, lakes and mountains holidays as well as tours and excursions. Balkan Holidays are winners of the 2011 British Travel Awards for the best tour operator to East and South East Europe. Balkan holidays are ABTA, ATOL and IATA registered. 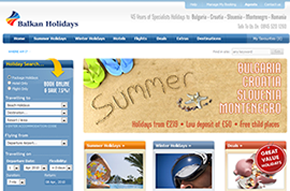 Balkan holidays utilises Verisign SSL to ensure secure credit card payments. There are cancellation charges if you cancel a booking with Balkan holidays. The fee changes depending on how close to the departure date you cancel. The exact charge could not be found during our visit - so please check this before you book. You should also consider taking out travel insurance that covers cancellation of your holiday under certain circumstances.